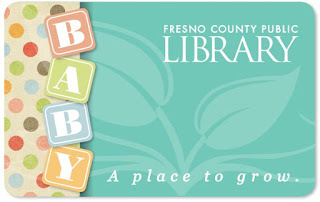 Because it's never too soon to introduce children to the Library, and to help foster an early love of learning, Fresno County Public Library has created cards and services specifically for our youngest readers. 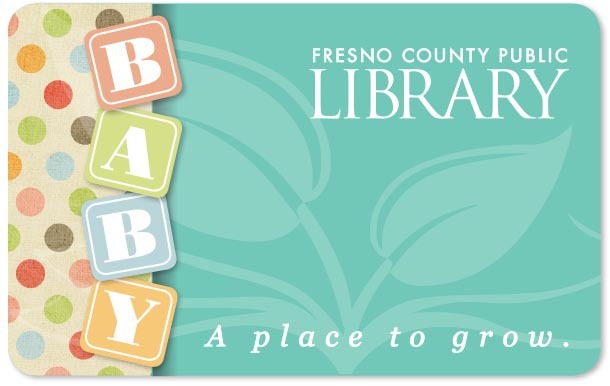 Babies and toddlers from birth to 35 months of age can get a special FCPL Baby’s First Library Card. This card comes with all of the same features and privileges of the Library’s standard children’s library card, but the card's design allows you to commemorate the first steps of your child's lifelong learning. These cards are available at any FCPL library branch, with the signature of a parent or guardian and appropriate photo ID. Once your child has a card, they can begin using library materials and resources right away. Children can check out a wide selection of board and picture books, and interact with fun early literacy tools such as BookFlix (online video storybooks) and ABCMouse. The Library also hosts story-times for toddlers and children at various branches (listed on the kids' events calendar), and children and families can access our Dial-A-Story line from any location, 24-hours a day (a new story every week! ).